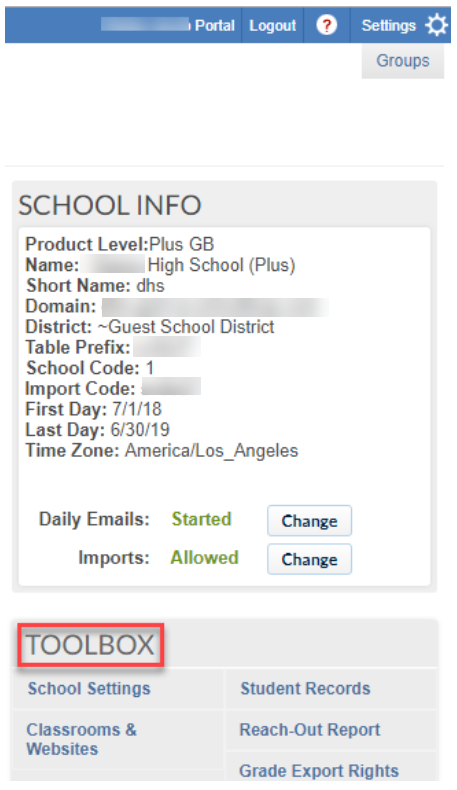 The School settings on the School Loop plus product has a section for managing the Access and Registration of its users. This extensive settings page controls who gets access to their accounts, when they are allowed access, and who can approve parent accounts. Additionally, there are customizable messages and a legend for users. The page also contains settings for OpenLoop, which is an optional service. Login to your School Loop plus account for your school and look for the Toolbox section. Click the School Settings link in the Toolbox Links on the right side of your portal. Click Go next to Access and Registration Management. Choose whether to show or hide the email icon next to staff names in the directory. Hiding the icon means that public visitors will not have access to the public contact email form. Click the Change button to toggle between Show and Hide. There are two possible settings. The default allows both student and parents to self-register, but the parent accounts must be approved by a staff member before they are allowed to view student grades. Additionally, LoopMail messages sent by unapproved parent accounts carry a disclaimer that the account has not yet been approved. The more stringent second setting also allows both students and parents to self-register, but they may not log in until after the account has been approved by a staff member. 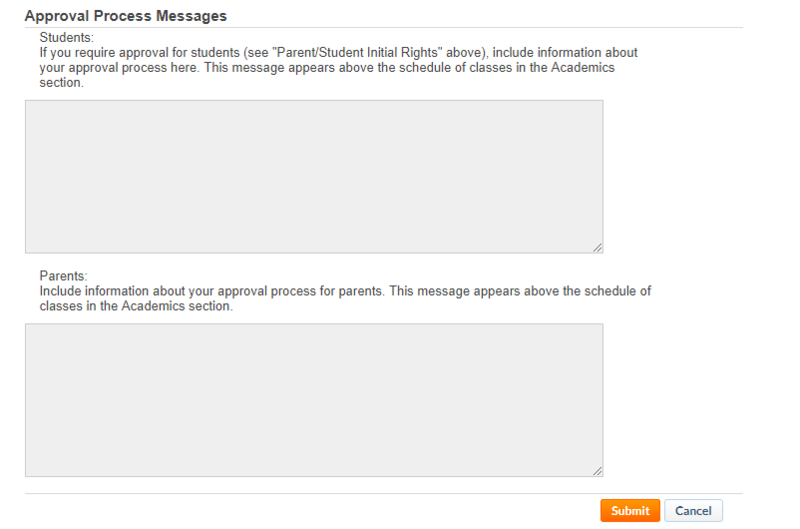 By default, parents can add additional students without additional approval. Click the Change button to toggle between the options. Adding students can be further restricted by the second option, by requiring approval each time a parent adds an additional student. It is possible to restrict staff, parent, and student access to grades. Teachers will always have access to the grades they publish for their students. Click the Change buttons to allow or revoke access for each user group. Allow Faculty to See Schedules Before First Day of School: By default, teachers cannot view their schedules and rosters until the first day of the school year, unless you grant access before the first day. This setting takes effect immediately and is typically used to allow School Loop training to take place during the pre-service days. Auto-Login on: For the sake of convenience, School Loop employs a secure technology that allows users limited ability to auto-login from their daily email or forwarded LoopMail messages. Most schools leave this setting on. Security Level: We do offer a Secure and Relaxed security setting, but we strongly advise that you leave this setting at Secure. Allow Parent and Student Access before the First Day of School: Once we roll schools to prepare for the new school year, parents and students lose access to their accounts until the first day of school. Changing this setting to Yes will give them access before the first day. All administrators can approve parent accounts (and students, if the more stringent setting is applied). Teachers can approve the parents of students enrolled in their classes. If you wish to give anyone with a staff account the same approval rights as administrators, check the box next to their name. These fields should be completed only by those who have selected the more stringent setting requiring approval for both students and parents. We recommend that your instructions for both students and parents include the steps required to gain approval, contact information for inquiries (name, phone number, email), and an estimate of the time required to approve accounts. If your school is exporting attendance data, please include the legend for your codes (e.g. A = Absent, V = Verified absence). The legend is displayed in the Attendance section of the Student Record. HTML can be used in this form to format your legend. For schools sending scores from Datawise, provide the users with additional information about the data uploaded to parent portals. Use this form to customize the message parents and students will see when they try to log in before the first day of school or before they have been granted early access. If this is left blank, the parents and students will see a generic message telling them that they will not be able to access their accounts until the first day of school. OpenLoop enables secure data sharing between School Loop and other applications. Set a generic password for all web service APIs, and/or a different password for a specific web service using the web-service name.